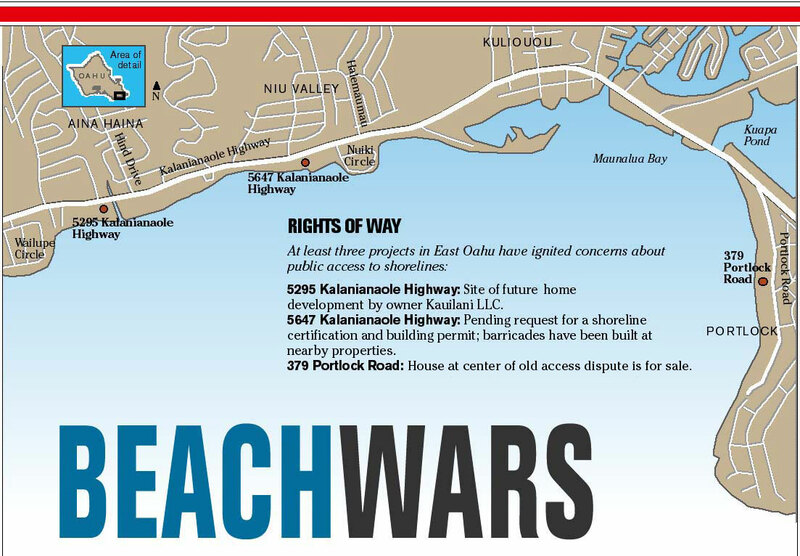 EAST OAHU residents, fed up with diminishing beach access, are banding together to pressure the state and city to preserve and improve public pathways to the shoreline. The effort brings together neighborhood associations, surfers, fishermen and families, some of whom will sign-wave during the evening rush hour Friday to focus attention on the issue. They won a first-round victory yesterday when the city government rejected a building permit for oceanfront land at 5295 Kalanianaole Highway, adjacent to Wailupe Stream, that had been advertised as the site of a future "luxury home development" by owner Kauilani LCC. Art Challacombe, chief of customer service for the Department of Planning and Permitting, said the application actually sought permission for only a single-family home, and that was denied because the application lacked a flood variance. "Clearly, in a flood zone, without a variance, construction cannot go forward, not of a fence, a house, nothing," he said, noting that the property owners could still seek such a variance. Repeated attempts to reach the landowners or their representatives were unsuccessful. The Kuliouou/Kalani Iki Neighborhood Board, Public Access Shoreline Hawaii and Hawaii Fishing News were among the groups that had objected to the application. "We have been working for months to shine some light on this issue, and it is great to see that the community has a voice and the process is working," said Chris Cramer, a teacher and surfer who lives in Aina Haina and has traversed East Oahu documenting dwindling public access. » 5295 Kalanianaole Highway: Site of future development by owner Kauilani LLC. » 5647 Kalanianaole Highway: Pending request for a shoreline certification and building permit; barricades have been built at nearby properties. » 379 Portlock Road: House at center of old access dispute is for sale. Jeannine Johnson, a member of the Kuliouou/Kalani Iki Neighborhood Board, also praised the decision but noted that the property is just one of several that has ignited objections. 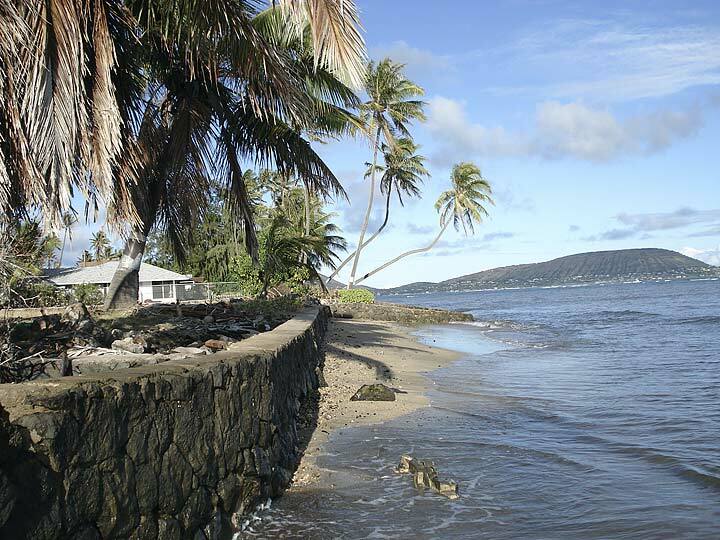 » A request for a shoreline certification and building permit at 5647 Kalanianaole Highway. Johnson has written to the county objecting to any construction that would limit public access to the adjacent Niu Valley stream, which in turn provides beach access. And she said the county had failed to prevent construction of barricades at other nearby properties, with the proliferation of fences and locked gates all along the makai side of Kalanianaole Highway, effectively "turning our public beaches into private beaches." Challacombe said a Planning Department employee would research the questions, but that the matter was more appropriately an issue for the state, which oversees shoreline certifications. As for walls and fences, he said, property owners who have built barriers 30 inches tall or higher without a permit could be fined $50 a day until the obstruction is removed or a permit is granted. The department would investigate specific complaints, he said. » Unresolved public access on Portlock Road to a beach used by generations of families for swimming and surfing. The city moved in 1998 to condemn four beach pathways on the road and convert them to public accessways, after the owner of 379 Portlock Road put up a locked gate on a private path residents had used for decades. But the effort stalled as landowner Bert Dohmen successfully sued the city. He and his family later moved and the Portlock Community Association publicly declared its intent to allow unimpeded access through privately owned beach lanes. But to this day some of the lanes carry signs reminding people that they are trespassing on private property and being monitored by video surveillance systems as they walk to the public beach. And 379 Portlock Road, like other homes on the road, is for sale, stoking fears that the issue could flare anew with every new owner. For lifelong resident Ann Marie Kirk, the only lasting solution is for the city to acquire official accessways on the road. "Otherwise, the community's use of the public beach is clearly at the whim of a few landowners," she said. "Public rights of way are important for all people of Hawaii." Challacombe said government regulations must balance the rights of property owners and the need for public access. "Both sides have rights, and sometimes they are at odds," he said. Advocates for increased beach access in East Oahu plan to demonstrate from about 4 to 6 p.m. Friday on the makai side of Kalanianaole Highway, between Waikui and Waieli streets. State law mandates the public's right to the beach, including the right of transit along the shore. In other words, a person should be able to get to the beach and then walk along it. That is impossible in some areas of Oahu. Lateral access along the shore has been affected by beach erosion exacerbated by seawalls, vegetation and other barriers put in by landowners, according to an analysis done for the state Legislature by the state Department of Land and Natural Resources. The problem is obvious in Black Point, Kahala, Lanikai and parts of East Oahu. Beach access over land -- including private property -- has decreased in neighborhoods such as Aina Haina and Niu Valley as homeowners on the makai side of the widened Kalanianaole Highway wall off their properties to increase security and reduce traffic noise and risks. "We're right on the main highway now. Cars could crash into the house," said one homeowner who refused to be quoted by name. When it comes to construction, the state certifies the shoreline, but the city grants building permits. The city is also responsible for developing and maintaining public access corridors. Art Challacombe, chief of customer service for the city Department of Planning and Permitting, said the public has two main ways to gain shoreline access. One is to sue for "prescriptive rights" to private pathways that plaintiffs can prove they had unimpeded access to for at least 20 years. The other is for the City Council to condemn and purchase private property and dedicate it as a public right of way. Condemnation is "by far the best way to guarantee access in perpetuity," he said. But the process can be long, costly and divisive. In the meantime, the state and city should better enforce existing shoreline certification and building permitting rules, said Elizabeth Reilly, a member of the Hawaii Kai Neighborhood Board and a founder of the Livable Hawaii Kai Hui. The city identified many of East Oahu's beach access problems years ago, but failed to solve them, she noted. For example, the East Honolulu Sustainable Communities Plan, published in 1999, recommended that the city acquire at least three public access points on Portlock Road to meet its standard of public shoreline access at about one-quarter-mile intervals. The plan also noted that few areas along the shoreline from Waialae to Koko Head were accessible, due to "rather continuous development" and the erection of sound-barrier walls. It recommended that the city acquire more pedestrian easements as properties were redeveloped or subdivided. "I think the key issue here is enforcement," Reilly said. "The problems are clear, and so are the solutions. They just have to enforce the law." 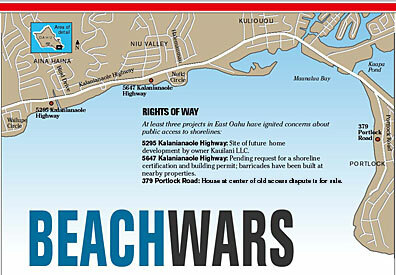 » A Page A1 photo caption and graphic yesterday incorrectly described proposed construction at 5295 Kalanianaole Highway. Although a "luxury home development" had been advertised at the site, the building permit application actually sought permission to build one single-family home, as the accompanying article said. The same graphic incorrectly said there were no-trespassing signs at 379 Portlock Road.